“André got a good amount of rest during the last 12 hours, but we had some problems finding calm air. André had 300m of resting periods but could only sleep for 170m. The autopilot is designed to function only in calm air so we had to wake André up from the MCC. This is a rude awakening for him so it made it more difficult for him to go back into sleep. Hovering over Hawaii in the early morning light. “André passed 76h 45min of flight, breaking Steve Fossett’s 2006 record for the longest solo flight (in any kind of plane). “In a few hours SI2 will climb up to 28 000ft until “Energy-Neutral Evening”, the point at which there will not be enough solar power to charge batteries. “Holding pattern: we’re slowing down the flight to ensure we cross the 2nd weather front at the optimal moment. 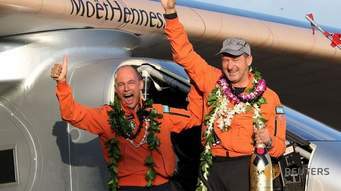 When Andre’ Borschberg landed at Kalaeloa Airport in the early morning of July 5, he had managed to climb the equivalent of five trips up Mt. Everest, and spent four days, 21 hours and 52 minutes at the controls of an airplane slower than most ultralight aircraft and bigger than a Boeing 747. Through incredible weather planning the ground support team in Monaco was able to have him hold until opportune moments allowed Andre’ to slip into tailwinds that sometimes drove his ground speed to over 70 mph. This ability to gauge clouds and winds across a 6,000 mile stretch of ocean was crucial to the success of the flight, and weather windows seemed to change for the good and bad mid-voyage. It will be interesting to see what the effects of repeated climbs to 28,000 and even 30,000 feet in an unpressurized cabin had on Andre’. He made his first steps in five days after a careful leg massage by a team member and with help from Bertrand Piccard. Considering the recent ordeal, he seemed to be cheerful and fully mobile. One might grow complacent, thinking the biggest part of the around-the-world trip is done, but there are still two oceans to cross, days growing shorter, and as always, unpredictable weather to outthink and outfly. The hazards are ever-present and the consequences of bad planning or execution just as severe. 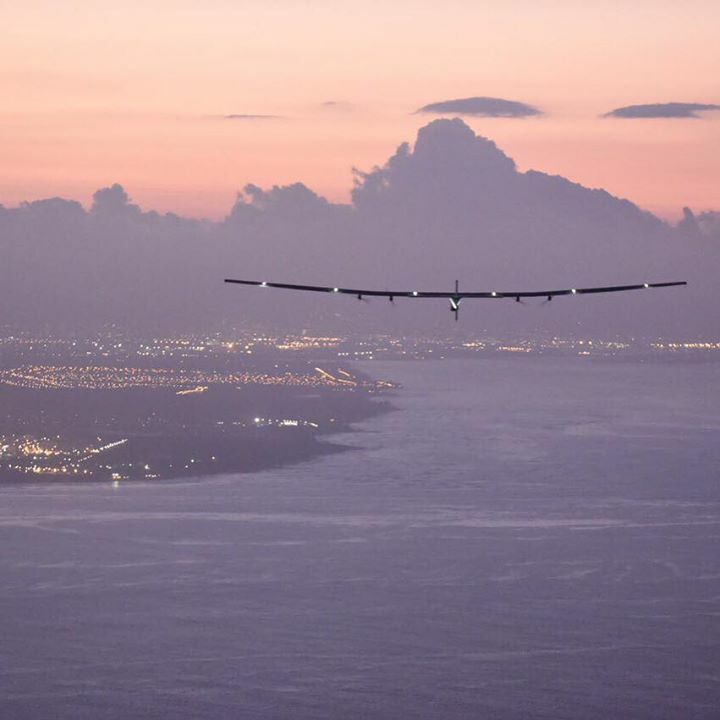 While Andre’ has a well-deserved rest and Bertrand and the Solar Impulse team prepare for the next leg of the RTW, we consider the worldwide importance of what these adventurers and scientists have accomplished. They’ve focused an otherwise fickle world on clean energy and potential solutions for what could become a climate crisis. They have encouraged millions to sign petitions pledging support for practical solutions at the upcoming climate conference, COP21, to be held in Paris in December. And they have made all of who share the sky and know its beauty quite proud to be at least vicarious passengers on their gigantic slow airplane.